A fully PC controlled SEM. 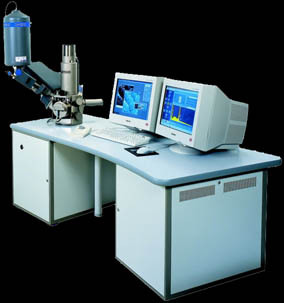 Outstanding optical properties, flicker-free digital image with super clarity, sophisticated software for microscope control and image capturing using Windows XP or Windows 2000 platforms, standard BMP, TIFF, and JPEG format of stored images, enhanced image archiving, processing and measurements, automatic set up of the microscope and many other automated operations are characteristic features of the equipment. with extra large field of view, etc. The sophisticated construction of the column without any mechanical centring elements and using fixed aperture provides comfortable operation and easy maintenance. The exchange of the effective final aperture is made in an electromagnetic way - the intermediate lens works as an "Aperture Changer". Superior specimen handling using an eucentric goniometer stage, ideal geometry for EDX. Fast and easy obtaining of the clean working vacuum by means of turbomolecular and rotary pumps.